This is a great place to stay. The courtyard gives it a uniqueness that very few hotels have. Beds are very comfortable. The free breakfast is from a menu and cooked to order. We stay here occasionally and everytime we do, it gets better. Looking forward to the next time we are through Lamar, co.
Come dine with us in our award winning steak house, Clementines! Looking for a great restaurant in Lamar, come to the Branding Iron Saloon! The Cow Palace Inn was opened in 1972 by a group of local businessmen and soon became known as the “go to place” in Southeast Colorado. Over the years, The Cow Palace has been the host to several large conventions and meetings such as Firemen’s and North American Falconeers, along with the “2 Shot Goose Hunt” which has been a yearly event since 1972. The 2 Shot Goose Hunt has been attended by many celebrities and continues to bring nationally known Sports and Movie stars to our community. 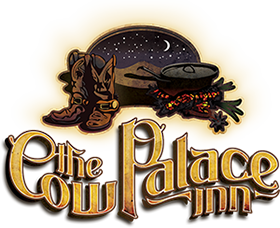 In August 2011, The Cow Palace Inn was purchased by Palace Holdings, LLC, with Doug and Lee Thrall as majority owners and managing members. Doug was raised in and graduated from Granada High School in 1968. Doug began his real estate career in May of 1972, and in 1974 he and his Broker moved into one of the office suites on the balcony at The Cow Palace. Because of his early association with The Cow Palace, Doug had great memories of what the Hotel/Convention Center meant to Southeastern Colorado, so when the opportunity to purchase The Cow Palace presented itself, Doug, Lee and partners jumped on the band wagon. The Cow Palace was in a bad state of repair with only 38 out of 100 rooms available to rent, no operating restaurant or lounge and outdated beds and televisions. Major renovations began almost immediately. New mattress and flat screen TV’s were put in the rooms, the kitchen was completely remodeled, dining room and lounge were given new décor and new menus were put in place. The tile floor in the front lobby with the original stockholders brands was brought back after being covered for many years. The inside pool and hot tub area were completely redone with a new deck built for the hot tub. The ownership remodel plan included going as “green” as possible by installing LED lighting and low flush toilets. New signage was put into place giving the hotel a new up-to-date look. At the time of purchase last year, The Cow Palace had eleven employees. Currently there are fifty-six people working at the Cow Palace. Clementine’s restaurant serves lunch, and dinner, and is fast becoming known as the best steakhouse in southeast Colorado. The new menu has several choices including the “featured” Cow Pie dessert. The Branding Iron Saloon is open 7 days a week at 5 p.m. and has 6 flat screen TV’s showing several sporting events. You can order your favorite cocktail or have dinner in the lounge. Rodeway Inn Cow Palace has 100 rooms available to rent, a restaurant, lounge, swimming pool, hot tub, wireless Internet, meeting rooms, and large banquet rooms. The hotel can accommodate your needs for out of town guests, dinners, meetings, weddings, and special functions including Christmas parties. The ownership and staff would like to thank everyone for their continued support during the remodeling and look forward to serving you in the future. Thank you very much! © 2019 The Cow Palace Inn – Lamar Colorado. All Rights Reserved.